Every hero needs a villain. But not all villains are dangerous some are incompetent, comical, or just weird. In his follow-up to The League of Regrettable Superheroes, author Jon Morris presents over a hundred of the strangest, most stupefying supervillains to ever see print in comics. Meet D-list rogues like Brickbat (choice of weapon: poisonous bricks), Robbing Hood (steals from the poor to give to the rich), Swarm (a crook made of bees; Nazi bees), and many more. 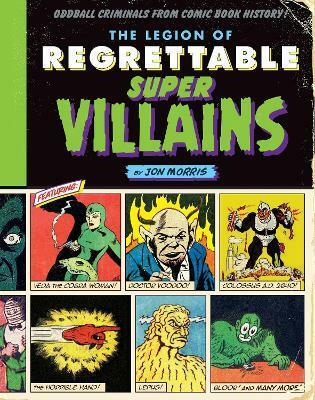 Drawing on the entire history of the medium, The Legion of Regrettable Supervillains affectionately and hilariously profiles oddball criminals from the history of comics. A cartoonist and graphic designer, Jon Morris is the author of The League of Regrettable Superheroes (Spring 2015), which sold nearly 20,000 copies in its first six months. Since the late 1900's, he's operated the blog Gone and Forgotten, an irreverent, in-depth look at the worst, the lowliest and most unfortunate stories and characters comic books have offered.